As Christmas has approached, I’ve been reminded that traditional Christmas songs have embodied some of the most hopeful messages for humanity ever written. This makes sense — their subject matter draws from the birth stories of Jesus, stories which themselves draw from the deeper impulses and hopes of the Jewish tradition, a tradition which saw humanity as nothing less than the heirs and children of God. Peace on earth. Good will towards men. The whole earth is to be pacified under this baby’s feet. Nations are to turn away from war, the violent are to lay down their weapons, the weak are to rise up and flourish. And then humanity will become what it was always destined to be — the caretakers of creation, the cultivators of new life, the namers of the cosmos. This vision is so gradiose, that it is really only ever captured in song. Even angels must resort to melody to carry the message. But this is the message that lies behind everything else in the biblical account, snaking its way among the ups and down of Jewish history, finally bursting into the light with the birth of Jesus. This baby will open a crack in history — becoming both the way by which this visison will come to be, and the first example of what this vision really means. In his life, he will act as the first true human, renewing and cultivating creation wherever he goes. He will embrace joy and good things, because he brings joy and good things to the world. He will show compassion, because that is what he is. He will speak truth, because truth is what he loves. And the cosmos will bow, because here at last, a human walks as the child of God. The universe is created and sustained on faith. Here is a strong example: I believe in one God, the Father almighty, maker of heaven and earth, of all things visible and invisible. I believe in one Lord Jesus Christ, the Only Begotten Son of God, born of the Father before all ages. God from God, Light from Light, true God from true God, begotten, not made, consubstantial with the Father; through him all things were made. For us men and for our salvation he came down from heaven, and by the Holy Spirit was incarnate of the Virgin Mary, and became man. For our sake he was crucified under Pontius Pilate, he suffered death and was buried, and rose again on the third day in accordance with the Scriptures. 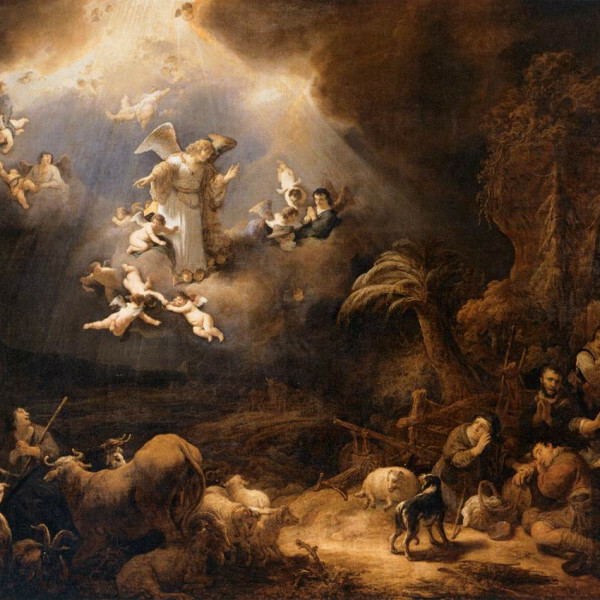 He ascended into heaven and is seated at the right hand of the Father. He will come again in glory to judge the living and the dead and his kingdom will have no end. I believe in the Holy Spirit, the Lord, the giver of life, who proceeds from the Father and the Son, who with the Father and the Son is adored and glorified, who has spoken through the prophets. I believe in one, holy, catholic and apostolic Church. I confess one baptism for the forgiveness of sins and I look forward to the resurrection of the dead and the life of the world to come. Amen. Well said Micah, except for a bit of ambiguity ( or a mistake ? ) in the very last sentence . You wrote : "And the comos will bow, because here at last, a human walks as the child of God . " Well, it could reasonably be argued that several OT figures "walked as a child of God " too, for instance Elijah. And in the present many men, including you and I can walk as children of God, not to mention all those who have been Born Again over the last 2,000 years. But the cosmos does not nor should we expect it to "bow down to us ". The cosmos, ie. all of Creation, bowed down to Jesus because he was much more than ' a human walking as a child of God' , He was God Incarnate, "God with us". Yes, we become true children of God ( Romans 8:5-16 ) when we fully give ourselves to Him, but that is not the same as being "The Son of God", of whom there is only one. Ah, but He also new well the wiles and habits of men. "I come not to bring peace, but a sword...". How many denominations and sects of Christians are there now? What atrocities have been commited in His name? Hence, the theme of your project: Christianity against religion. It "seems" or at least one hopes, that the celebration that is Christmas manifests itself in our best behavior: respect and esteem for Jesus Christ and all he tried to teach us, a humble admission that we have failed, for the past 364 days, to live up to and practice it, and the sincere hope that we can do better. I see people around me, and realize that I have failed more miserably than most, which makes me sad. But the "traditional" christmas music especially, and even some of the newer works, make me feel calmer, and more hopeful, less desperate, less futile. I hope it helps everyone in that way, to be ready for the upcoming new year with something other than parties and broken resolutions. It is not your specific beliefs that will save you, it is your actions toward all other living beings, including the Earth itself. Maybe this music and atmosphere of the holidays will help to enable and focus the kinds of actions that Jesus taught and exemplified. He sacrificed his life, but to follow his example, we only need to sacrifice our arrogance and material pride.